Capoeira Angola is an Afro-Brazilian art form that combines elements of martial arts, music and dance. 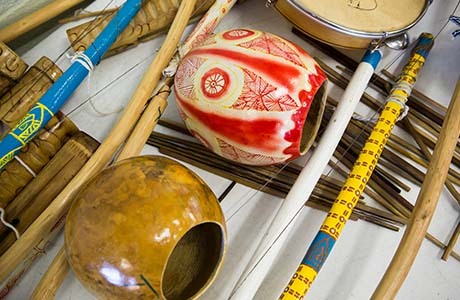 Participants form a circle (roda) and take turns playing musical instruments, singing, or ritually ‘sparring’ in pairs in the centre of the roda. The sparring is marked by fluid play and sweeping arm and leg movements. It is a non-violent and non-contact performance. Capoeira Angola arose out of the struggle of the Afro-Brazilian population of Brazil, many of whom were brought from Angola to work as slaves in the 16th century. The Angolans brought with them traditional dance, movement and music that evolved to become known as Capoeira de Angola, a martial art disguised as a dance. Capoeira Angola was a mental and physical system of defence against oppression. Many of the young people from refugee backgrounds that come to STARTTS have experienced high levels of trauma associated with their experience of dispossession, conflict or living in refugee camps. 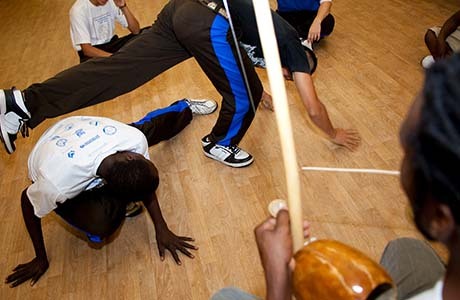 Capoeira Angola promotes empowerment, respect, self awareness and developing individual strengths while being a member of the group – all important elements for a young person who is coming to terms with trauma. Classes are lead by Mestre Roxinho who brings with him 30 years of experience. Mestre Roxinho was bestowed the title Mestre, or ‘Master’, by the Capoeira Angola community acknowledging that he is one of the true ‘voices’ of Capoeira Angola. Mestre Roxinho guides the group, teaches movement, songs and dance, controls the roda and is a role model for our students. STARTTS counsellor and social worker Chiara Ridolfi supports Mestre in running the project, along with project assistant and former student Evelyn Agripa. Project Bantu is a psycho-social intervention that brings Capoeira Angola to young people from Aboriginal or refugee backgrounds in NSW. STARTTS and Project Bantu came together in 2006 to hold classes for young people from refugee or refugee like backgrounds in western Sydney. “I like it because everyone here is from different cultures and they have different ways of thinking and socialising…it makes me feel happy”. “Sometimes I get scared a little bit in the beginning of playing but then I like showing everyone that I can do it. It makes me feel good inside when I can do it”. “I like the music and the moving because in my country we dance like that…nothing else here is like my country but Capoeira is just the same as our dancing and our singing”. “I feel healthy now. The first class I couldn’t even move”. Contact Mestre Roxinho, Capaoeira Angloa Teacher, on 9646 6700 or by email. You can read more about the Capoeira Program at STARTTS in this article in Issue 26 of Refugee Transitions. 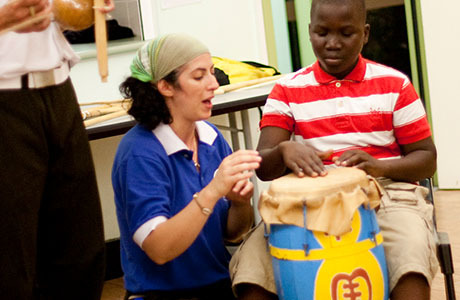 The 2012 Refugee Ball, STARTTS’ major fundraising event, raised money for the Capoeira project. You can hear about how important the Capoeira project is to the students and teachers who participate in it by watching their speeches here.